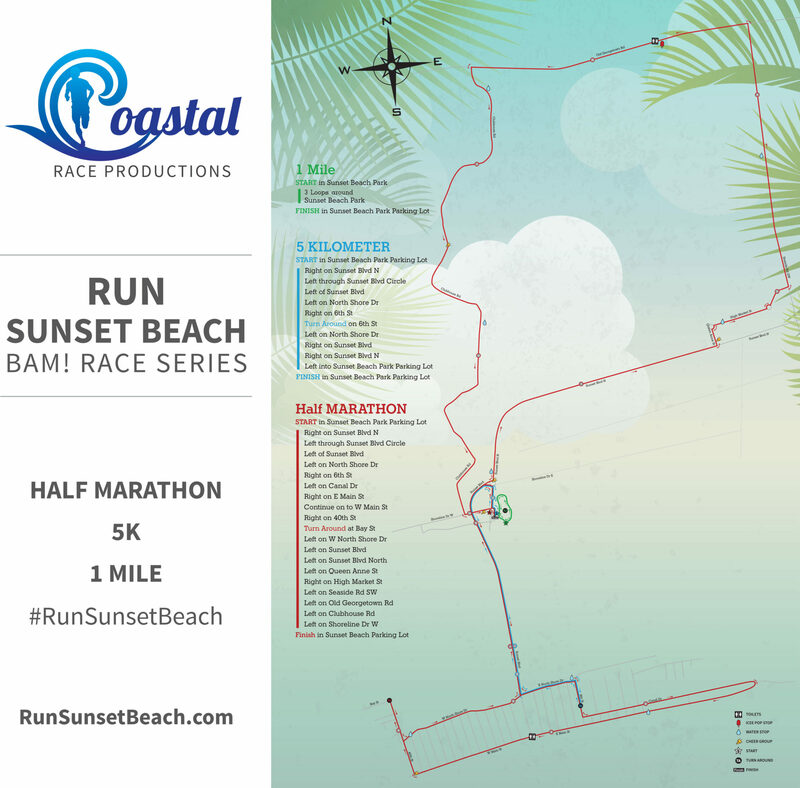 The 6th Annual Run Sunset Beach event will take place on March 30th, 2019. This is typically the largest road race in Brunswick County with about 2,000 runners from 40 different states. Runners park out by the Ingram Planetarium (HERE) and the start/finish area is in the Sunset Beach Waterfront Park (HERE). 5K runners go over the bridge onto the island, turn onto E. North Shore and down 6th St. then right back while the Half Marathon (13.1 miles) takes a lap around the entire island, through Queen Anne St. & High Market St. to 904, Georgetown Rd. and all the way through Sea Trail down Clubhouse Rd. before exiting onto Shoreline Dr. W. and back into the park. The races start at 7:00am and everyone is off of the road by 10:30am. We’ll include some key areas to avoid but in general, if you don’t have to be on the road that morning, please wait until after 9:30 if at all possible 🙂 If you are on ANY road with runners, please drive extra slow and cheer them on. There will be a lot of traffic control coning, officers, EMS, and over 100 volunteers along the course helping to make this race happen. If you’d like to volunteer, please click here to pick a spot to volunteer. All volunteers have a ton of fun, you’ll get a race shirt and we’ll make a donation to the local non-profit of your choice for your volunteering efforts. Thank you! #1) No Eastbound vehicles allowed on Georgetown Rd. between Clubhouse Rd. & 904 from 7:45am to 10:00am. If you’re coming from Calabash toward Sunset/OIB, I’d highly recommend taking hwy 17 even if it adds 10 minutes to your drive, it may save you 30 minutes. This also affects any vehicles exiting the Sea Trail Community (on Clubhouse Rd. ), Sandpiper Community & Wyndfall Community – you will be forced to drive West & I’d strongly encourage you to turn upto Hwy 17 (see #2 below). #2) You won’t be able to drive toward the park – From Shoreline W., The Bridge, or South on Sunset Blvd. 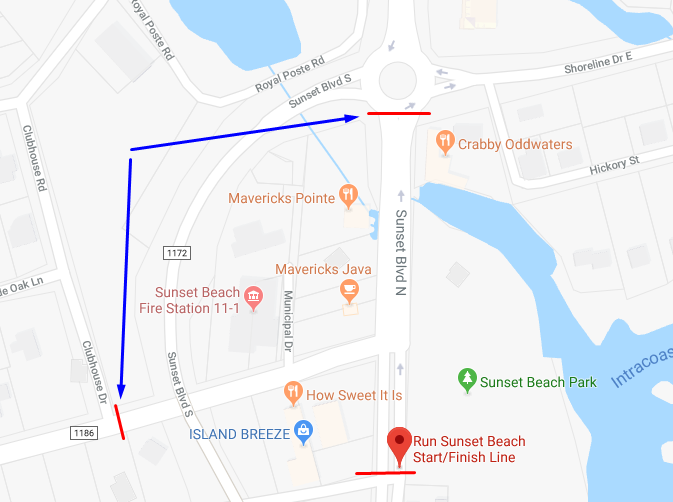 If you’re traveling westbound on Shoreline Dr. W., an officer will route you through Sea Trail to exit onto Sunset Blvd from one of the other exits on Clubhouse or Wisteria. This will be down to 1 lane between 6:45am and 8:15am. Please drive slowly! #4) Lots Of Runners On Roads! Runners take a loop all the way around the island (open course) sharing with vehicles. Runners have a coned bike lane on Sunset Blvd. to Queen Anne St. Runners take Clubhouse Rd all the way through Sea Trail from Georgetown Rd. to Shoreline Dr. W. (open course) sharing the road with vehicles. PLEASE be very patient and drive slowly – cheer on runners too!